Ironically, now that women can vote, lead companies, and run the free world, we are increasingly prone toby starving our bodies. 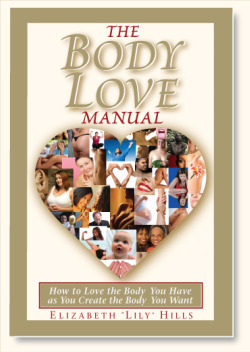 As a certified (if not unorthodox) feminist with a women's studies degree, I could not help but gobble up Elizabeth "Lily" Hills recent book called 'The Body Love Manual' -- a work of monumental importance to modern women everywhere. A veritable instruction book on 'How to Love the Body You Have as You Create the Body You Want,' the author easily invites our curiosity and interest with the seeming paradox. How indeed can the typical body-image concerned woman (most of the American female population) attain her ideal weight or physique in the midst of true admiration and appreciation for who she is in the present moment? It would stand to reason that if one was truly happy with her body or appearance, she would not need to strive for anything extra. Furthermore, what if a woman's physical ideal is completely unrealistic, if not unhealthy or harmful? Those might be the questions that run through your mind as you pick up this book. Still, you open it up to find some truly great answers -- ones that can help to deprogram the way that you might have viewed yourself and others for a long while. Without question, we are all immersed in a culture increasingly preoccupied with the importance of aesthetics. But unlike yesteryears, the dominant beauty ideal is harder to achieve in natural healthy ways than ever before, which is in part due to skinny trends, the digital editing of purportedly 'beautiful' models, and plastic surgery -- all in tandem to the omnipresence of fast food and Sprinkles cupcakes that temp us along the way. But let's stop for a moment. Success and happiness are obviously not entirely contingent upon appearance. . . Which begs the question of why we continue to care about it disproportionately! Why indeed is it so important to be ultra good-looking in the face of feminist progress? (Not that we can't enjoy being cute or anything.) Nevertheless, why are women still putting undue pressure on themselves to be physically perfect even though their livelihoods no longer depend on their ability to attract a wealthy caretaker? Women and men now have similar occupations: ergo, woman shouldn't need to use their appearance as a resource unless their profession directly involves the promotion of physical aesthetics. Based on the simplest and somehow the most genius way of approaching pervasive attitudes toward food and body, Hills deconstructs how she and many other women initially become afflicted with disordered thinking, which in turn leads to disordered living. Describing how a great number of woman unwittingly ignore the wisdom of their own bodies, the author turns the mirror on the reader. Identifying thought processes that might have been ignored, she challenges deeply-ingrained belief systems with common sense, patience, and understanding, presenting an expansive set of gentle arguments in favor of healthier alternatives. Setting the stage for change, Hills then tells her readers how they can realistically feel better about themselves and look their best. Far from telling all of us to "just think happy thoughts and know you're beautiful" and other hard-to-invoke *jewels of wisdom*, this mentor gives you practical, employable solutions for achieving unprecedented results -- all of which will depend on how much you care to listen to your own body! Though reading the work of Elizabeth Hills might seem tantamount to getting more advice on the same topic that has been pulverized by diet 'experts,' our real-life expert and teacher literally enriches us with knowledge about how we can find peace in the easiest of ways . As such, I would highly recommend it to women who have ever had problems with the tiniest of body image issues as well as those with serious eating disorders -- all could benefit greatly from reading and absorbing this work.